Effective corporate event management means you need to evolve your approach to match the way your attendee learns each year. Through the years, off-the-shelf events are collecting dust and corporate event planning is focusing budgets and minds on creating unique, experiential events. You’ve gathered all your people together in a meaningful way, whether it’s an event, meeting, leadership forum, etc. What’s your “WOW” factor? How do you turn this into an experience – something that they’re still thinking about on the flight home? Often, this stems from your internal communication strategy which will help define how you engage your people and create a stronger brand community. CPG has investigated 5 emerging trends that will lead the charge in event production. Break-out sessions don’t have to be in the ballroom. Some major retailers and franchise conventions are keeping their attendees guessing by providing interactive pop-up experiences outside the event location. The key here is to offer something extra – a tangible, unexpected bit of scenic that uses tech to create a memorable experience for the attendee and brings a particular part of the event’s message to life. For a retail franchise, this could be a pop-up store showing the new layout of their cafe, or a grocery chain displaying a new aisle set-up with sponsored gratis on the shelves. Look what food trucks have done for the restaurant experience. How can you incorporate that logic to your event? This one shouldn’t come as a surprise, because it’s been on the horizon for the past decade. It’s time, however, may have finally arrived. There is a giddy delight that comes from being able to move and interact with computer-generated images inside our physical world. In fact, the success of Pokémon Go has shown just how immersive Augmented Reality could be for events. This disruptive technology is being used to tell brand stories through 360 video, supercharge activations with a virtual landscape and gamify the event experience through custom gameplay that communicates your brand message. All the major players, Facebook, Sony, Google and more, are all in. Their involvement and investment will continue to make this a more accessible, affordable (and wearable) technology that will make its way into your event one way or another. People have grown quite accustomed to technology pairing them off with like-minded individuals – why should your event be any different? CPG often uses meeting apps to create a networking aspect at corporate events. It’s an instrumental tool in finding and connecting with prospects or colleagues, and it helps cut down on awkward networking so you can match up with your fellow sales reps, executives, etc. and start driving productivity. The ROI comes from integrating this feature into your existing meeting app as well as leveraging your sponsors to mitigate cost while increasing attendance due to increased engagement. Another great way to increase your sponsor dollars and decrease your event’s carbon footprint is the digital swag bag. Nevermind the stacks of brochures and handouts that consistently fail to engage your people – there’s another option. A digital swag bag typically comes in the form of a branded flash drive or a gated area of a website that features online gifts, virtual offers and digital coupons that can be easily perused and redeemed online. This ease-of-use makes your attendee more likely to engage and use each offer rather than drop a bag of paper into the trash as they exit. More corporate events are adopting this technologically advanced, environmentally friendly option. Don’t discuss financial projections for 45 minutes on a PowerPoint presentation and expect your attendees to retain that message. They’ve likely been playing on their phone for the last half an hour. Engagement comes through interactivity – and it’s why so many corporate events are changing their presentation formats. More specifically, presentation formats are going mobile. To ensure participation, audiences are being asked to interact with presentations in-browser on their mobile device or through attendee tablets. This allows for live polling features, gamified presentations with competitions and prizes, virtual note-taking (even on the actual slide), and pinch-and-zoom features on the slideshare. This method guarantees audience participation, involvement and engagement. Every event is different. 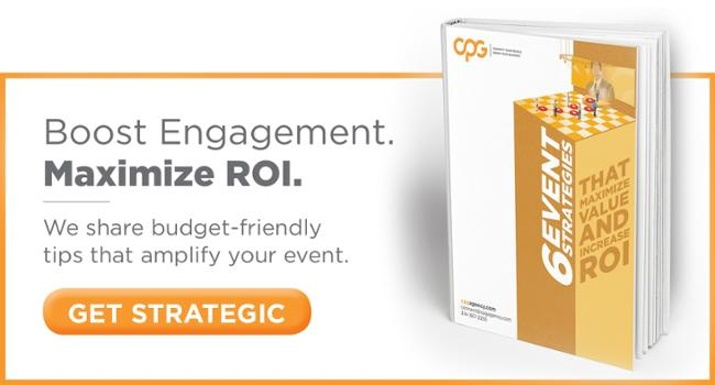 CPG can help you identify the game-changing trends that will deliver your brand message to your attendees and keep them engaged long after the event concludes.